Endometriosis and Infertility – Endometriosis can be associated with severe pain and fertility problems. About 30% to 40% of women with endometriosis have some trouble conceiving. The reason for this is not well understood, and scarring of the reproductive tract, or hormonal factors may be involved. Over time endometrial implants may grow, or cysts may result because of endometriosis, which also may cause fertility problems. Endometriosis symptoms – Some women experience mild symptoms, but others can have moderate to severe symptoms. The severity of your pain doesn’t indicate the degree or stage of the condition. You may have a mild form of the disease, yet suffer from agonizing pain. It’s also possible to have a severe form and have very little discomfort. You may also have no symptoms. It’s important that you get yearly gynecological exams. This will allow your gynecologist to monitor any changes. 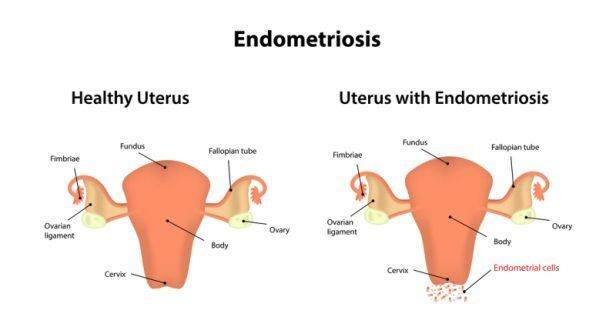 Endometriosis Treatment – Endometriosis has no cure. Medical and surgical options are available to help reduce your symptoms and manage any potential complications. They may then recommend surgery if your condition doesn’t improve. Pain medications – Over-the-counter pain medications such as ibuprofen can be used, but these aren’t effective in all cases. Hormonal therapy – Taking supplemental hormones can sometimes relieve pain. This therapy helps your body to regulate the monthly changes in hormones that promote the tissue growth that occurs when you have endometriosis. Hormonal contraceptives – Hormonal contraceptives decrease fertility by preventing the monthly growth and buildup of endometrial tissue. Birth control pills, patches, and vaginal rings can reduce or even eliminate the pain in less severe endometriosis. Conservative surgery – It is for women who want to get pregnant or suffer from severe pain. The goal of conservative surgery is to remove or destroy endometrial growths without damaging your reproductive organs.This can be done through traditional open surgery, in which endometrial growths are removed through a wide incision. Laparoscopy – A less invasive surgery, is another option. Your surgeon will make some small incisions in your abdomen to remove the growths in this type of surgery. Radical surgery (hysterectomy) – The doctor may recommend a total hysterectomy as a last resort if your condition doesn’t improve with other treatments.